Quantum physics has led to new types of sensors, secure data transmission methods and researchers are working toward computers. However, the main obstacle is finding the right way to couple and precisely control a sufficient number of quantum systems (for example, individual atoms). A team of researchers from TU Wien and Harvard University has found a new way to transfer quantum information. They propose using tiny mechanical vibrations. The atoms are coupled via phonons—the smallest quantum mechanical units of vibrations or sound waves. "We are testing tiny diamonds with built-in silicon atoms—these quantum systems are particularly promising," says Professor Peter Rabl from TU Wien. "Normally, diamonds are made exclusively of carbon, but adding silicon atoms in certain places creates defects in the crystal lattice where quantum information can be stored." These microscopic flaws in the crystal lattice can be used like tiny switches that can be toggled between a state of higher energy and a state of lower energy using microwaves. Together with a team from Harvard University, Peter Rabl's research group has developed a new idea to achieve the targeted coupling of these quanta within the diamond. One by one, they can be built into a tiny diamond rod measuring only a few micrometres in length, like individual pearls on a necklace. Just like a tuning fork, this rod can then be made to vibrate—however, these vibrations are so small that they can only be described using quantum theory. It is through these vibrations that the silicon atoms can form a quantum-mechanical link to each other. "Light is made from photons, the quantum of light. In the same way, mechanical vibrations or sound waves can also be described in a quantum-mechanical manner. They are composed of phonons—the smallest possible units of mechanical vibration," explains Peter Rabl. As the research team has now been able to show using simulation calculations, any number of these quanta can be linked together in the diamond rod via phonons. The individual silicon atoms are switched on and off using microwaves. During this process, they emit or absorb phonons. This creates a quantum entanglement of the silicon defects, thus allowing quantum information to be transferred. Until now, it was not clear whether something like this was even possible. "Usually you would expect the phonons to be absorbed somewhere, or to come into contact with the environment and thus lose their quantum mechanical properties," says Peter Rabl. "Phonons are the enemy of quantum information, so to speak. But with our calculations, we were able to show that, when controlled appropriately using microwaves, the phonons are, in fact, useable for technical applications." The main advantage of this new technology lies in its scalability. "There are many ideas for quantum systems that, in principle, can be used for technological applications. The biggest problem is that it is very difficult to connect enough of them to be able to carry out complicated computing operations," says Peter Rabl. 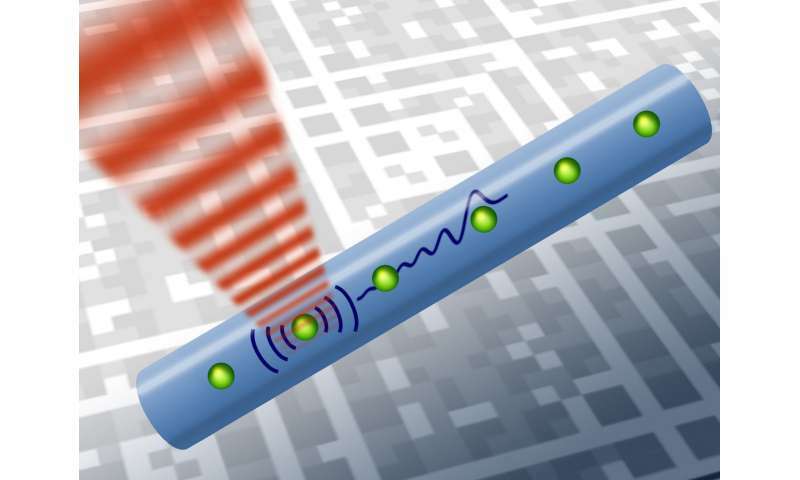 The new strategy of using phonons for this purpose could pave the way to a scalable quantum technology.